The spin course covers spin theory, efficient recovery and typical flight situations that lead to inadvertent spins. Recoveries by instruments, emergency spin recovery procedures and a twenty turn spin may be included. The course may serve as a spin sign-off for the aspiring flight instructor as required by 14 CFR 61.183. The Cessna Aerobat provides a solid and safe trainer for spins. 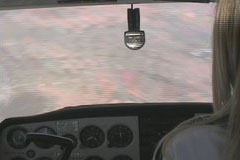 With approximately three to four hours of ground school and two flights, this is normally a one-day course for one or two people. The spin course is $800. Catherine has personally taken Wilbur to sixty turns in a single spin with a recovery as efficient as after three.